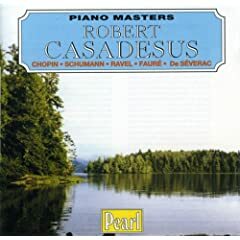 Funny, I bought a Pearl Casadesus CD recently, but it wasn't that one. Mine has Beethoven, Haydn and Scarlatti. I haven't opened yet. Can anyone report on his Chopin? Moravec's Nocturne is my best choice~! You have a really good picture. Sokolov, Pollini, Cortot, Francois, Kissin - Great performances. I've heard Stephen Vladar's playing recently, that was not bad. Wow! I have about seven sets and only one of yours- the Cortot! How do you like the Francois set, if you have it? I don't have it yet, but I heard it. This is a very melancholy and unique playing. If Chopin lives today, he will love this playing, in my aspect. Cortot is a 'MASTER', isn't it? I know that he is very well revered! I need to hear my recording some more before I decide how much I like him. I sure love his Schumann though. DVD next week. I will report back if you are interested. I have his preludes. I like Francois in Chopin, in general. But his style is very straightforward, not a trace of poeticism (for lack of a (better) word) to be found. I guess it is one of those recordings that's just as easy to hate. So what is the best recording of "Introduction and Polonaise brillante for cello & piano in C major, Op. 3"? I have just heard Argerich/Rostropovich which was really good. Any other alternatives? I wonder what do you think about the Ballades played by Cortot? Should I sample them? And if so, which recording/CD? 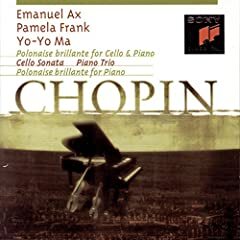 For anyone who actually wants to know about Chopin, I would suggest speaking to Herman, who no longers posts here, for he is an expert. Sidoze may also be able to help, as he is great too. I doubt they are the only two knowledgeable about Chopin and his discography. Besides, with Herman long-gone and Sidoze usually gone, help from them might be elusive. If they came out on Naxos, that's where I'd get them from. MDT online has some Cortot on Naxos, last I checked. I own the Preludes and the Waltzes, but would need to hear them again before giving an informed opinion on them. BTW, who else do you have in the Ballades? So far, I have Perahia, Cziffra, Casadesus and Moiseiwitsch (Appian) + different individual recordings spreaded around. I definately like the Perahia recording best, but some aspects of the Cziffra and Casadesus are also exciting. I see that they have the below 1929 set of the Ballades at MDT, but I know he re-recorded them in 1933 (so I wonder which is the best). How much of the Chopin ouevre did Cziffra record? I've read that 1929 are no better than the ones from 1933. However, the same source says that his Ballades are without the high artistic merits of Rubinstein, Perahia and Wild. Another source, David Dubal, says he likes Ax, Cherkassky, Davidovich, Hofmann, Zimerman and Rubinstein. He only likes Cortot's #1. I say get the Ballades (coupled with the scherzos) by Rubinstein. Not sure, but I know that there is much in that bargain EMI box!